Damon Lord: 42 Worcester Horror Night tonight! 42 Worcester Horror Night tonight! Tonight is the big one, the event I've been looking forward to all year. And I'm one of the 'warm-up' acts! I'll be performing first tonight, from 7:30pm. I'll be performing my long-awaited werewolf-themed narrative poem, "The Ballad of the Wolf House". 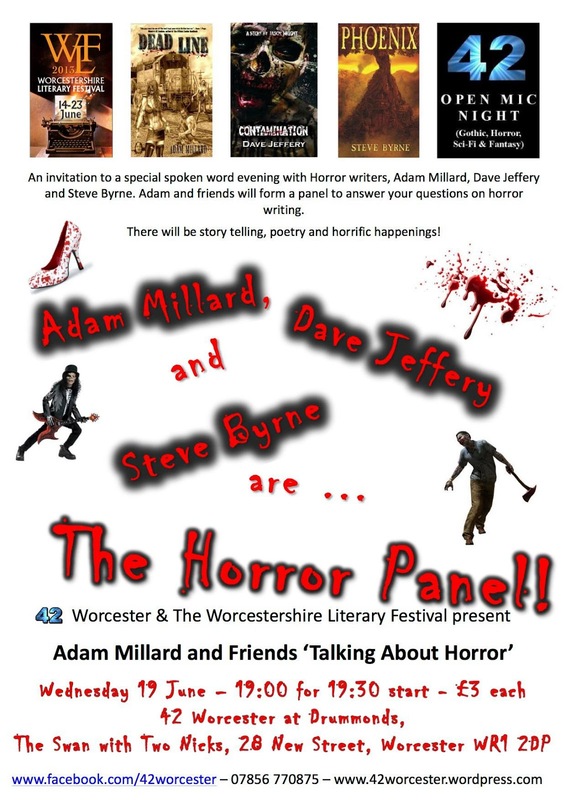 42 Worcester, the Gothic, Horror, Sci-Fi and Fantasy monthly event in Worcestershire, is delighted to announce three best selling UK Horror writers coming along to the WLF and 42 Worcester Special in June 2013. Authors Adam Millard, Dave Jeffery and Steve Byrne will be made welcome at Drummonds Bar at The Swan with Two Nicks, 19 June 2013. They will form a panel to discuss with local writers and horror aficionados what horror writing is about and how the best writers approach it. Steve Byrne is the author of ‘Phoenix’, a dark horror novel set during the Vietnam War. He’s had a number of short stories published – the latest will appear in the anthology ‘No Monsters Allowed’. Steve was born and bred in Wolverhampton. His parents soon feared that something wasn’t right. While the other kids were reading Enid Blyton, his head was buried in a copy of the latest James Herbert. Dave Jeffery is perhaps best known for his zombie novel Necropolis Rising which has gone on to be a UK #1 Bestseller. His Young Adult work includes the critically acclaimed Beatrice Beecham Series, BBC: Headroom endorsed Finding Jericho and the 2012 Edge Hill Prize Long-listed Campfire Chillers short story collection. His short story Daddy Dearest features in the award-winning Holiday of the Dead anthology (this is Horror Awards, Best Anthology, 2012). Adam Millard is the author of thirteen novels and more than a hundred short stories. Probably best known for his post-apocalyptic fiction, Adam also writes fantasy/horror for children. He created the character Peter Crombie, Teenage Zombie just so he had something decent to read to his son at bedtime. Adam also writes Bizarro fiction for several publishers, who enjoy his tales of flesh-eating clown-beetles and rabies-infected derrieres so much that they keep printing them. When he’s not writing about the nightmarish creatures battling for supremacy, Adam writes for ‘This Is Horror’, whose columnists include Shaun Hutson, Simon Bestwick and Simon Marshall-Jones. Come along to hear what Adam, Dave and Steve have to tell us about successfully publishing their work. They will value your questions and give you insight to the world of horror and publication in the genre. Tickets are just £3 on the door or can be bought online.